Often when photographers present themselves (or their work) online, they do so with a flurry of images - they want to show every photograph they've ever taken. Thankfully, editors become involved in many cases, and this process gets curated. However, we still often see many photographs presented in any one interview. This despite the fact that many photographers will be remembered for a single image - if they are remembered at all. For this conversation, with internationally recognized Yanidel, I wanted to corner him into talking about only one photograph. Rather than see so many, and not really see at all, I wanted us to really study, discuss, and enjoy a single image. 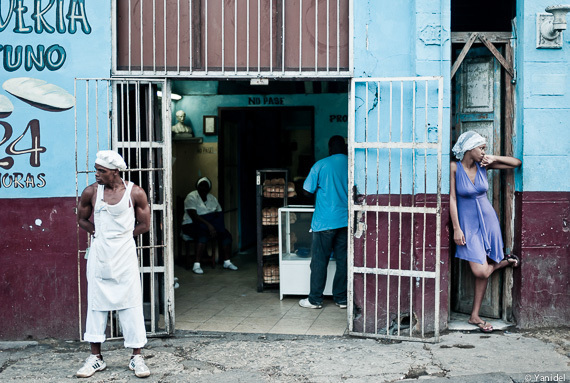 That image is his, "The Baker's Fight" from Havana, Cuba. Michael Ernest Sweet: Yanick, I love this photograph. The colors, the subjects, and their respective positions within the frame, even the scene within the shop - it's all nearly perfect. In fact, it seems as though it's almost choreographed. Did you interact with these people in any way before making the photograph? Yanick: No, it is very rare that I interact with my subjects before the first frame. In this case, I took one shot very quickly and moved on. The two main subjects were so absorbed in their inner world that they never noticed me. MES: Where was this photograph made? Y: Somewhere in downtown Havana in Cuba. MES: How is it photographing on the street in Cuba? Do people mind that you are there, aiming a camera at them? Y: It is probably one of the easiest places in the world to take photographs. Cubans are easy going, and a picture is often an opportunity to start a little chat. This being said, it is kind of an awkward situation given that what makes Cuba visually interesting for a photographer (the state of decay, the precarity, the old American cars) are the results of 50 years of an authoritarian regime. Cubans would certainly prefer a better standard of life. MES: You call this photograph, "The Bakers' Fight", can you tell us more about that choice of title? Y: I never witnessed a fight, the title is only the result of my imagination. I thought it could be one of the many interpretations of the scene, among so many others. MES: Do you title all of your photographs? Y: Always, I like to provide a hint about what I saw, or how I interpreted the scene. Then, I leave it up to the viewer to either stick with my story, or come up with her own. In any case, we are both wrong, we will never know what was exactly going on in any given picture. I understand that some people believe that a picture should say it all by itself, but I don't, context is sometimes very important to understanding or appreciating a photograph. Many of the world's most famous pictures would never stand on their own without some context. MES: How do you go about finding titles? Do they just pop out at you, or do you have some more calculated method? Y: Most of the titles come to mind after the fact. It is extremely difficult to assimilate all the elements going on in a scene when taking the picture. Sometimes a small detail spotted after the fact can lead to a good title. MES: This stands out, at least to me, as one of those photographs that sort of needs to be in color. Do you agree? Could the image succeed in monochrome? Y: I believe that the color palette does add an extra dimension to this picture. This being said, it also works well in black and white due to its contrast and the key element, which is really the interaction between the two main subjects. MES: On the far left of the photograph there is some text - nothing distinguishable, but text nonetheless - how do you feel about text in a photograph? Y: Words are everywhere in the city and therefore find their way into many photographs. Sometimes it is relevant to the picture, sometimes not. In the end, it is just one more element with which to be creative. In the case of this picture, the text itself is not relevant, but the drawing of the bread does provide some context to the scene. MES: Do you ever crop your images? Is this the full frame? Y: Yes, I do slightly crop when needed. I am not really good at straightening my camera and there is nothing I hate more than a bent horizon line. Yet I don't crop excessively, since I always find that the resulting picture does not correspond to what I initially saw. It is kind of odd, but I feel it is no longer my picture when this happens. MES: What camera were you using when you made this photograph? Y: A Leica M8 with 35mm Summilux Asph, which accompanied me on this 80 week trip around the world. MES: Do you always use a Leica? Y: No, anything that resembles a rangefinder. The frameline system is what works best for me, I love the ability to see what is about to enter the frame in the optical viewfinder without lifting my eye. Also, I zone focus a lot, so a manual distance ring on the lens is a must for me. Few brands of digital cameras offer it nowadays, but it is a constant on rangefinders like the Leicas. I still sometimes use an Epson R-D1, which was the first digital rangefinder and still remains unmatched in terms of ergonomics. MES: Given the tremendous expense of the Leica brand, can you explain to me why you feel the camera setup (being digital with a limited lifespan) is worth the price, especially given that a Fujifilm X100, for example, is about 1/10th the cost? Y: If one buys a Leica, it means that his income is high enough so that he doesn't have to worry about the limited lifespan of the camera. Nowadays, most buyers are high income amateurs, and first generation used digital bodies (Leica M8) can now be acquired at a significantly lower price. In terms of image quality, the difference has shrunk significantly over the last few years between the various brands, but Leica remains unmatched in terms of craftsmanship. MES: Are you sponsored by Leica in any way? Y: No, I sometimes feel that I am sponsoring them. Indeed, I have had way too many problems on the three bodies I own. Each time it meant a lengthy trip to their repair facility and quite expensive repairs. Product support is by far the weak link at Leica in my experience. It shouldn't be the case when you are asked to pay such a premium. MES: Not sure that sounds like good craftsmanship. But let's move along. Yanick, you've been working the streets quite seriously for many years now. I assume you have thousands of images in your archive. How does this photograph rank? Y: Having visited over 25 countries during this trip, I believe it is one of the only photographs that succeeds in describing the whole experience of a country in one scene. In my eyes, this picture represents Cuba, that is a mix of decay, nostalgia, but also sensuality and color. This being said, visually and emotionally speaking there are quite a few pictures of mine that I would rank higher. MES: Do you think a photographer can have a "best" photograph, that is, just one single image that is their definitive work? Y: Well, quite a few famous photographers are known for one photograph, at least by the general public. Yet, what is most difficult is to create a body of work that is made up of 100 great photographs. That is my ultimate goal, though it will probably take me a few more decades to achieve. Meanwhile, my best photograph is always the next one. MES: I know when I make a photograph like this - something with an iconic feel - I am a bit bummed for a while. What I mean is, when we make a great image it sometimes feels like we can't do any better. Do you ever feel like this? Do you ever feel that you've done your best work already - that you've already reached the mountain top? Y: I know that I have reached a point where I have developed a style that I feel comfortable with and control well. I know my strengths and I am also aware of my weaknesses. From there, one can either scrap everything and try to reinvent himself in terms of style, or look for new venues or projects adopting the same style. I have tried to reinvent my shooting style, but with no great success and I didn't particularly enjoy the process either. In the end, I shoot for pleasure and my pictures reflect my own perception of the world, the style is just a derivative. Y: When in lack of inspiration, the books I always turn to are the ones of photographers such as Saul Leiter, Ara Güler, Robert Frank or Brassai. I am definitely attracted by street photography with a poetic feel. MES: Do you look to your contemporaries for inspiration, or just the masters - the famous people? Y: I do look at modern street photography and my contemporaries, mainly on social networks. Yet, to be sincere, I am not too fond of the current mainstream. Too often I get the feeling that a photograph has been taken more to showcase the skill of the photographer, than to provide a meaningful picture. This is probably a side effect of the emergence of social networks and the instant feedback it provides. Multiple planes, juxtapositions, oddities, or color matching seem to be the flavor of the decade, with stories taking a backseat. Too often I look at a picture and think either "Well seen", "great timing" or "how weird" and forget about it immediately. Yet, when looking at a picture of one of the masters I mentioned, I often feel pulled into the frame and am able to relive the moment. Yet, my opinion is probably biased by what can be seen online. Fifty years from now the most famous street photographers of our time will probably be people that currently fly under the radar. MES: Yes, likely so. I always return to the idea Woody Allen puts forward; essentially we are addicted to nostalgia. Perhaps photographs need some aging before we find them truly inspiring. I do totally agree with you about too many contemporary photographers and their obsession with being technically perfect while photographing nothing. Moving on, tell us about some projects you are working on? Y: My wife and I moved to Argentina a couple of years ago, yet the arrival of our little one and our new business venture have left me little time to shoot. This being said, this is temporary and if things turn out as planned, I'll be able to dedicate a lot of time to street photography in the near future. MES: Yanick, I want to thank you for taking the time with us to discuss this photograph, "The Baker's Fight". You have certainly become a constant on the contemporary street photography scene and I know people will be happy to see you return to your camera soon. Until then, best of luck with the little one and your new business venture. Y: Thank you, Michael, for inviting me. With people like you and initiatives such as this one, street photography can only grow. It also helps the general public to understand what we are as street photographers - our motives and goals. Follow Yanidel on his website or through his online portfolio. You can also find him on Twitter. Want to have your photography featured here? Tweet me your best images @28mmphotos to be considered for an upcoming feature.